This was quite a tough drawing for me in a number of ways. 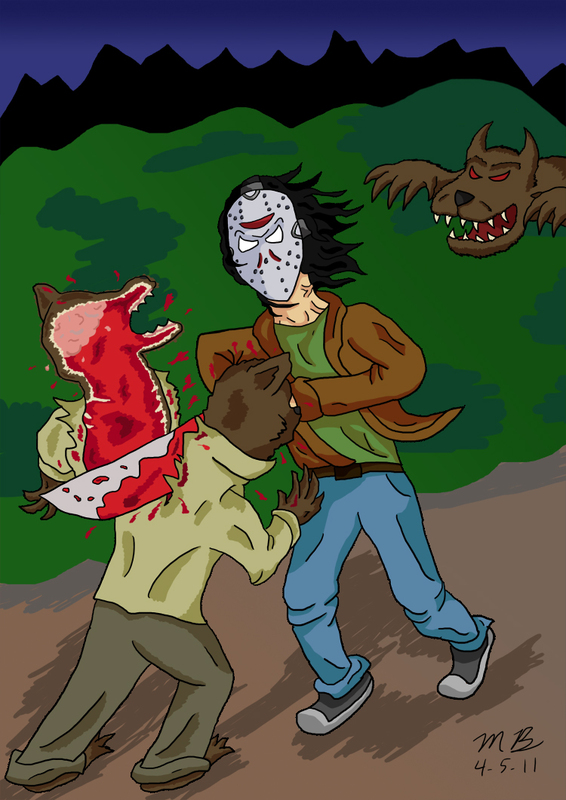 BTW, it was done for the comic JMR: Jason Must Rule. Check it out. It’s good, clean horror fun. So obviously this is a bit outside of what I’ve normally been drawing for the last decade or two, but this is very much the type of thing I would draw as a child. Yeah, I was an odd kid. I’ve mentioned that I have an strong interest in the occult, and love to draw the supernatural when I get a chance. My favorite comic is Hellboy, half for the beautiful art and half for the subject matter. My wife and I watch a lot of shows about the supernatural, and we’ve probably seen every horror movie ever made. Alex and I do work some supernatural into Black Snow and I’m Famous!, and usually you can thank me for that. But that’s a pretty minor element of both comics. So why was this hard to draw? In case you haven’t been keeping score at home I pretty much draw comedy, especially for the last year plus, and it’s comedy without a whole lot of action for that matter. Dramatic full body characters in fight has never been my strong suit, at least in my opinion. I think I pulled it off reasonably well in a few issues Black Snow, most notably 5. But it’s not what I really do. So why didn’t I just draw Jason here in a comedic situation, like I did with Titanox? Because I wanted a challenge, and I wanted to capture what the comic and character were really about. And that’s killing monsters in brutal ways! So how did I do? I like it, and think I pulled it off pretty well. It’s sufficiently brutal. It’s got some nice horror elements. The characters are posed pretty well. I’m very happy with my coloring. This was a drawing where I had to erase and redraw things quite a few times, something I don’t normally do. Usually I’m quite satisfied with my first pass at things. This drawing also had a ton of layers, for you Photoshop users. The werewolf split in two was one of the more complex things I’ve had to pull off in quite some time. But I think the end result was a cool effect. So overall I’m pretty happy with this one. By the way, this Jason reminds me of a deranged Casey Jones from the Ninja Turtles.